• Discusses a range of manual and automatic measuring devices along with their specific functions and the specialized functions involved in their use. 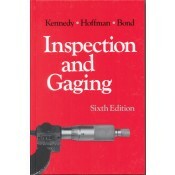 • Analyzes the methods and duties of inspectors. • Appropriate for use by inspection supervisors, plant managers, quality control engineers and subcontractors. • Includes SPC and other data analysis methods for manufacturing applications. • Provides detailed discussions of available measuring and quantitative systems. • Compares important measuring and gaging systems.